Our skilled Brisbane metal curving technicians offer a wide range of section curving services. We offer a wide range of metal curving options – so whatever the requirements of your unique project, you’re sure to find the high quality, accurate solution you’re looking for. 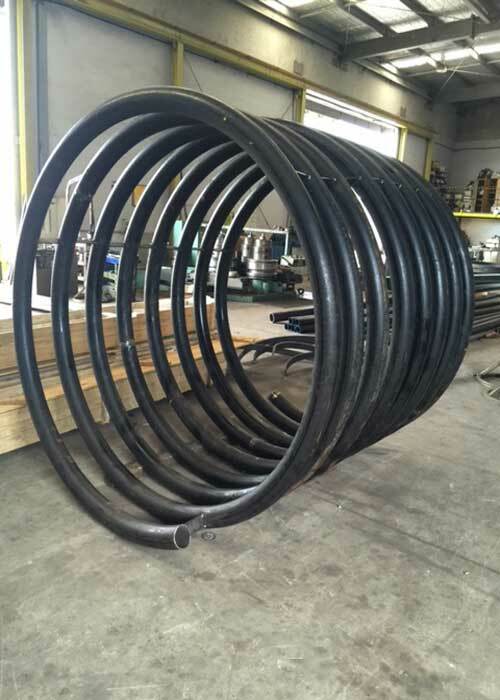 The types of services we offer include: ring rolling, section curving, angle bending, channel bending, angle curving, angle rolling, flat bar rolling, flat bar curving, square hollow section rolling, rectangular hollow section curving, universal bending and more. We curve a variety of metals including steel, aluminium and brass. Click here to view examples of the metal curving dimensions we work to. If the size you’re looking for isn’t included, give our team a call to go through your options. We love finding out more about your job requirements, and will go out of our way to help you with our metal curving service. Our specialist metal curving technicians have been chosen to work on many international projects over the years. This is because we have the skills and the capacity to provide section curving for large jobs, without compromising on quality – and we deliver on time, every time. If you need curved metal for your overseas project – and want to work with a company who can provide top quality curved sections within budget – give us a call NOW. Call now on 07 3271 2225 to chat to one of our helpful team members about your metal curving project.